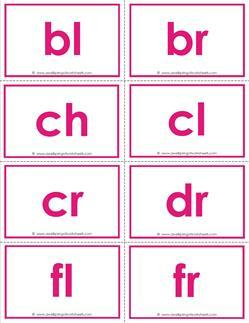 These beginning consonant blends flashcards have all 36 blends. The first set is the plain Jane version in no-nonsense black and white. The second set comes in a nice bright pink. The third set comes with eight words for each blend so kids can practice the blends. Some words are harder than others. For longer lasting flashcards, print them on cardstock and laminate. Print multiple black and white sets for center times and use a different color cardstock for each set. 3 sets of beginning consonant blends flashcards. Please go to this page to see all the first grade phonics resources on this site. Beginning consonant blends flashcards in black and white. 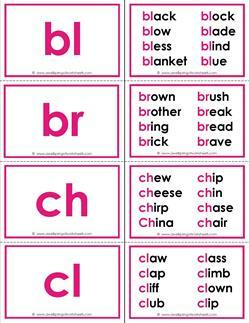 Includes all 36 beginning consonant blends on 5 pages. Beginning consonant blends flashcards in color. Includes all 36 beginning consonant blends on 6 pages. 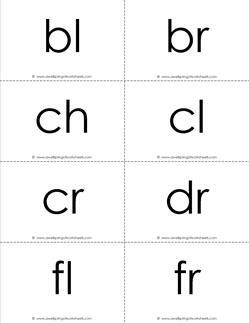 36 beginning consonant blends on 10 pages. Fold on dark lines, cut ONLY on dotted lines. See directions on pg 10.